As Government legislation increasing targets buy-to-let investors, high quality tax planning is essential. Recent changes to restrict the tax relief on finance costs (mortgage interest and related mortgage arrangement fees) can result in higher rate tax payers owning property in their own name paying more than 100% of their profits in tax. Even basic rate taxpayers can find themselves paying more tax because the change to the rules mean they are pushed into the higher rate tax band. To combat this, more and more investors are considering putting their property into a company structure. This guide explains the advantages and disadvantages and the key criteria for making a decision. The rules around treatment of finance costs on buy-to-let investments changed in 2017/18. Before this, finance costs were an allowable expense against your rental income even for individuals and jointly owner properties. From 2020 finance costs will not be an allowable expense, a separate tax relief at 20% of the costs will be given. We are currently mid way through a transition period between both regimes, meaning that 50% of your finance costs will be treated in the old and new regimes. For the purpose of this guide we are comparing the tax between different ownership structures based on the new (post 2020) rules. This makes the guide simpler to follow. We also believe that property investment is normally a long term investment so it's more relevant to look at the new rules and disregard the transition period. If a shorter time period is more relevant to you then feel free to contact us for some more tailored analysis and advice. For property with large mortgages, where the mortgage interest is more than 75% of the rental income (net of other expenses), higher rate tax payers make a loss after tax. For additional rate taxpayers this is reduced to 68%. Even below these thresholds tax will eat up most of your profits. Your property income, for tax purpose, is calculated before finance costs (the 20% tax relief is a reduction in your tax bill applied later). Previously your income was calculated on your actual profit after finance costs (which is typically much smaller). This can push you into a higher rate tax band; and for higher earners may cause, or exacerbate, loss of other tax benefits such as your personal allowance and annual pension contribution limit. If your plan is to build a larger portfolio of profits, the lower tax rate on limited companies is a key advantage. If you hold the property as an individual (or joinly with others) you will most likely be paying income tax at 40% or 45%, and will only receive 20% tax relief on their finance costs. The same investment inside a company will only pay corporation tax at 19%, and will receive tax relief in full on finance costs. Since you are leaving the profit inside the company (to put towards further investments) there is no Income Tax to pay. If you don't need the rental profits in the short term, the limited company structure allows you to leave the profits inside the company. As above, you'll only pay tax at 19% on profits and receive tax relief in full on your finance costs. The accumulated profit can then be drawn down when you're in retirement, where you'll likely be paying tax at a lower rate. If you have existing properties that are held as an individual (even jointly with other owners) there are upfront tax implications for transferring them into a limited company. The transfer must be treated as a sale, at market value, meaning that Capital Gains Tax is due on any gains made since you bought the property, and Stamp Duty Land Tax is also due. For an existing property portfolio the upfront tax on incorporation can be very high, and careful tax planning is needed to weigh this up against the ongoing benefits. The exception to this is if your buy to let business is already operating as a partnership. This is because partnerships can incorporate without paying upfront Capital Gains Tax and without any Stamp Duty Land Tax. We expect that HMRC will increasingly challenge this practice, so it's essential that the partnership is an established bona fide partnership (with a partnership agreement, partnership bank account and genuine profit sharing) that the property has been owned by the partnership for some time before incorporation. Your profits will be subject to corporation tax at 19% (planned to reduce to 17% by 2020), but there will be a second tax charge when you take this money out of the company. There are several means to do this, but the most common is to pay a dividend out of your company profits. The first £2,000 will be tax free, but the remainder will be subject to Income Tax at 7.5% (basic rate), 32.5% (higher rate) and 38.5% (additional rate) depending on your overall income level. In contrast, individuals would pay a single amount of tax at 20% (basic rate), 40% (higher rate) and 45% (additional rate). On the other hand these tax rates are applied to profits before finance costs (with finance costs getting 20% tax relief). 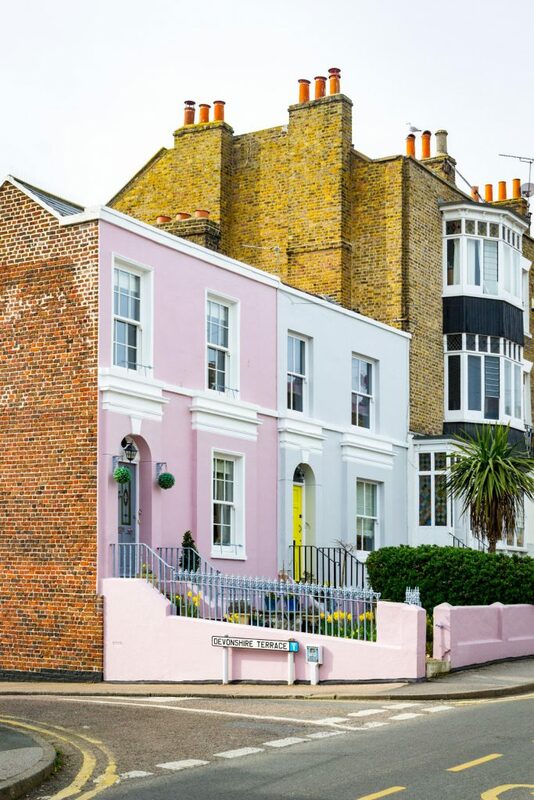 If you do need to make use of rental income in the shorter term (rather than reinvesting in new property, or saving for retirement) then your tax bill may be lower by owning the property as an individual (or joint owner). This depends on your overall income and the size of mortgage you need. We'd recommend you seek advice tailored to your individual circumstances. There are significant tax savings available to individuals when selling a home they've previously lived in - as described in our guide to taxation of buy-to-let properties. These tax reliefs can be applied to more than one property, so if you're intending to make any of the homes in your portfolio your main residence before selling you can benefit substantially. These reliefs are not available for properties held within a company. When selling a property held within a company, corporation tax is paid on any gain you make on the sale (at 19%) and further Income Tax is paid if you extract the money from the company (as above). The gain is calculated based on the selling price less the original purchase price and the cost of any improvements (such as extentions or new fittings). A company is entiteld to an "indexation allowance" which allows it to increase the purchase price and other costs based on the different between the Retail Price Index (RPI) when the cost was incurred and, and the RPI as at December 2017. If you own the property as an individual (or joint owner) there is no "indexation allowance", but you are entitled to an annual tax free amount of £11,700. Further gains after this are taxed at 18% or 28% depending on your overall income in that year. Whether or not the "indexation allowance" is more valuable than the annual tax free amount depends on your overall income level, the value of the properties being sold in that year and the length of time you've held them. But over time (due to the freezing of indexation allowance) there's likely to be a benefit in private ownership. Especially if you plan to sell properties gradually over time so that you can make use of more than one year's worth of annual allowance. A limited company has legal obligations to file accounts with Companies House, and you will have the added complexity of completing company and individual tax returns and filing these with HMRC. If you have properties worth more than £500,000 you must also file an "Annual Tax on Enveloped Dwellings" (ATED) tax return. Normally this won't involve any additional tax (provided the properties are let to third parties) but you will need to claim the appropriate tax relief. If the property is unlet, or lived in by family members, you may have to pay additional tax based on the value of the property. At present there are fewer lenders willing to offer buy-to-let mortgages on property held within a company. This means you may not be able to access the very best interest rates in the market. There are multiple factors to consider in choosing the optimal property structure. The issues in this guide need to be applied to your individual circumstances, and there can be substantial tax savings if you get things right. Why not contact for individually tailored advice about the savings you could make?